Are you ready to make your house one of the most fun and frightening places to trick-or-treat in the neighborhood? It's great to have a line of ghouls and goblins out your door on Halloween but clean up from a lot of traditional spooky decor can be a little annoying. Seriously, we've sometimes found wayward cotton spiderwebs in the bushes months and months afterward. While that might be a convenience for the birds who are looking for premium nesting materials in the spring, it makes your house look like it's suffering from a giant spider infestation! This year, compliment your jack-o-lanterns with even more drama and very little cleanup with this skeleton projection light! 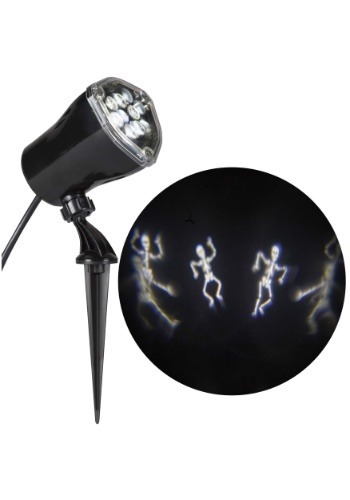 Set this light up in your lawn, plug it in, and you'll have skeletons dancing on your wall in no time! The closer you place it on the desired wall you'd like to project on, the clearer and smaller the image will be. It's the perfect way to make your house seem pleasantly haunted just for one night! Once you've got this light set up, get ready for plenty of trick-or-treaters to head your way. You're sure to see all the cutest and scariest (in a good way) when you've got this bony beacon dancing on your facade. And the best part, no pumpkin guts or runaway spider webs involved. That means you'll have more time to practice your spooky handing out candy face!